Sam "Lightnin'" Hopkins (March 15, 1912 – January 30, 1982) was a blues guitar musician, from Houston, Texas who became a popular recording artist on the R&B charts in the late 1940s and early 1950s, and then experienced even greater success among white audiences during the blues revival of the 1960s. Hopkins toured widely and was a perennial favorite at folk festivals and coffee houses, even playing a command performance for Queen Elizabeth II in London. He was able to create a uniquely complete sound for a solo performer, due to his dexterity on the guitar and his engaging vocal personality. He recorded more than 80 albums and is considered highly influential among the young blues musicians who went on to play in well known rock bands in the 1970s and 1980s. He has been called "the very personification of Texas blues" (Clayton 2005). Sam Hopkins was born in Centerville, Texas to Abe and Frances (Sims) Hopkins. Together with his mother and five siblings, little Sam moved to Leona, Texas after his father died in 1915. His first instrument was a home-made guitar fashioned from a cigar box, which he got when he was eight years old. 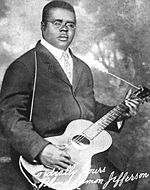 A major influence on his playing was Blind Lemon Jefferson, who sometimes partnered with Hopkins' cousin, Texas Alexander, and encouraged him to to develop his talent. While still in his teens, Sam started living the bluesman's life, traveling by hitchhiking or "riding the rails" and playing for dances and parties. His marriage to Elamer Lacey produced several children, but did not endure, due to Hopkin's rambling. After a stint in prison, he returned to his musician's life in the late 1930s. His unique style—characterized by a strong, dampened bass line, punctuated by slaps, flourishes, and short powerful leads or fills in the treble register—was born from spending countless hours playing for small dance crowds without a backing band. When Hopkins and Alexander were playing in Houston in 1946, Hopkins was discovered by Lola Anne Cullum of Los Angeles', Aladdin Records. A piano player who backed Hopkins in the first Aladdin sessions reportedly gave him the nickname Lightnin’, probably because of Hopkins' nimble playing style. Hopkins' partnership with Alladin resulted more than 40 singles, but he also recorded for numerous other labels, including Houston's Gold Star Records. Hopkins eventually made his home in in Houston, touring occasionally. In the late 1940s and early 1950s he recorded a large number of songs, which sold well to the black audience. His biggest record was “Shotgun Blues” (1950) which reached number five on the Billboard R & B chart. Among his other hits were “Short Haired Women" (1947) and “Penitentiary Blues” (1959). His album Mojo Hand (1960) is considered a classic. In the early 1960s, Hopkins began to play the folk circuit, where his solo performances and engaging personality were well received. He played often at venues such as The Ash Grove in Los Angeles and similar venues on the East Coast. In 1964, he performed with with Pete Seeger and Joan Baez at Carnegie Hall, as well as at the Newport Folk Festival, where he was well received but somewhat overshadowed by newly rediscovered bluesmen such as Skip James and Mississippi John Hurt. Later, he opened for such acts as the Grateful Dead and Jefferson Airplane in San Francisco's premier rock venues such as the famed Filmore West. In 1968, Hopkins recorded the album Free Form Patterns backed by psychedelic rock band the 13th Floor Elevators. A film devoted to his music—The Blues Accordin' to Lightnin' Hopkins (1969)—won the outstanding documentary prize at the Chicago Film Festival in 1970. Hopkins was also popular in Europe, toured globally, and recorded at least 85 albums in all. He became less active after being injured in a car crash in 1970. However, he gave a command performance for Queen Elizabeth II in the early 1970s, and in 1972—partnering with Taj Majal, whom he had met earlier at Los Angeles' Ash Grove—he worked on the soundtrack to the motion picture Sounder. His death on January 30, 1982 was due to cancer of the esophagus. At his funeral, he was mourned by more than 4,000, fans, friends, and fellow musicians. He was buried in Forest Park Cemetery in Houston. Although he usually performed solo, Hopkins was a gregarious spirit who thoroughly engaged his audience. Sitting on stage with his gold front teeth flashing, he tapped his feet enthusiastically and sometimes danced in his seat. Instrumentally, his dynamics were unmatched, as he went from soft bass accompaniment of his vocals to loud, screaming treble riffs up the neck of his amplified acoustic guitar in a seamless, and seemingly effortless display. Hand gestures, facial expressions ranging from sorrow to wry grins, and other body language added to the expressiveness of his act. His instrumental virtuosity, however, was never an end in itself. Rather, he placed it in the service of his art, which was simply, the blues. In addition to his standard songs, like many bluesmen, Hopkins' often composed impromptu lyrics and melodic variations. No two sets by him were ever the same. He was a fluent stage performer whose banter disarmed audiences. His songs were often humorous and self-deprecating but also bespoke the suffering that typifies the blues. Yet for Hopkins, one did not have to be either poor or black to know the blues: "If you've ever had a sad feeling," he said in an interview, "you can tell the whole round world you ain't got nothing but the blues." Jimi Hendrix reportedly became interested in blues music from listening to Lightnin' Hopkins records with his father. Hopkins was a great influence on many local musicians around Houston and Austin, Texas in the 1950s and 1960s, as well as on young blues enthusiasts who attended his many concerts at folk venues nationwide. Though far from simple, his straightforward style as a solo act was highly accessible to young guitarists who had not yet joined bands. He was an influence on Jimmie Vaughan's work and particularly on the vocals and blues style of Ron "Pigpen" McKernan, the keyboardist of the Grateful Dead until 1972. He was also an important influence on Townes Van Zandt, the Texan folk/blues songwriter and performer, who often performed Hopkins numbers in his live performances. A song named after him was recorded by R.E.M. on their album Document. Doyle Bramhall II is another Texas artist who was influenced by Hopkins, as evidenced by a tattoo of Lightning on his upper left arm. In 1980, Hopkins was inducted into The Blues Foundation Hall of Fame. His Gibson J-160e guitar is on display at the Rock n' Roll Hall of Fame in Cleveland, Ohio. 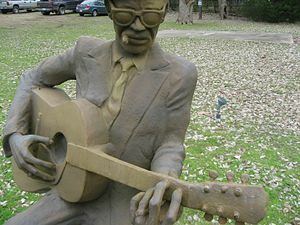 In 2002, the town of Crockett, near Hopkins' birthpalce, erected a memorial statue in his honor in Lightnin’ Hopkins Park. The Houston Chronicle included Hopkins in their list of "100 Tall Texans," 100 important Texans that influenced the world. The George Bush Presidential Library and Museum included Hopkins in a "100 Tall Texans" exhibit that opened in September 2006. The display includes Lightnin's Guild Starfire electric guitar and a performance video. This page was last modified on 6 July 2018, at 16:41.